What we observe today in force structure planning for the RAAF combat fleet, and its supporting rationale, is a fundamental realignment to a force structure which priorities battlefield air interdiction and close air support capabilities over the long established doctrine of prioritising air superiority and strategic strike capabilities. This unstated doctrine will expose Australia to pressure by regional nations, and increase dependency on US combat assets in an unprecedented fashion. The reasoning which justifies this change is underpinned largely by mythology, as proper analysis was never performed. Politically and strategically less painful alternatives exploiting the F-111 and F/A-22A all vanish as the current JSF-centric plan is implemented. This paper explores many of these myths. The plan for premature retirement of the RAAF's F-111 fleet is the most far reaching force structure change for the RAAF, and the ADF as a whole, seen for many decades. As such it will have significant consequences for the RAAF many of which are not widely understood, even in RAAF circles. For three decades the F-111 has been the backbone of the RAAF combat fleet, providing a strike capability with no peer in this region. In context, Australia's thirty plus F-111s provide around 50% of the RAAF's aggregate strike capability, and a long range and persistent precision guided munitions delivery capability without aerial refuelling tanker support. In budgetary terms, the F-111 capability is a bargain, costing around 3.5% of the annual Defence budget to operate. 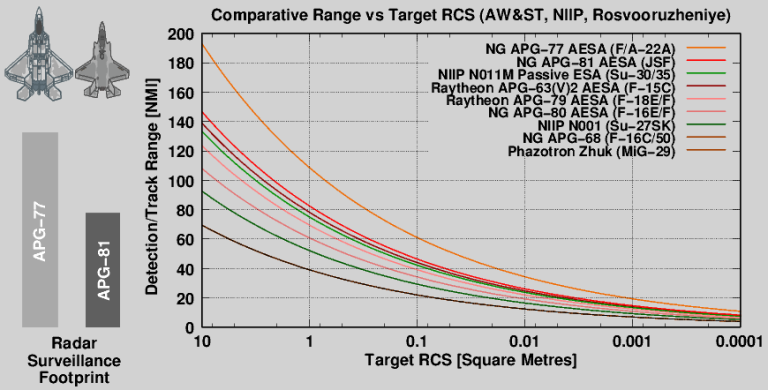 Providing the equivalent capability using smaller fighters like the F/A-18A or JSF supported by tankers typically costs around 70% more, per aimpoint hit, than using the F-111. Removal of the F-111 chops down RAAF strike capability against the White Paper goal of four years ago by 40% - if we believe Air Force leadership statements – or closer to 60% if we employ hard quantitative measures. Much has been said and written about this issue, in the broadcast media, trade press, daily press and in parliamentary committee submissions. That the debate has attracted such interest, and persisted for over a year now without abating, indicates very clearly that there is little enthusiasm for the early retirement of the F-111 outside the corridors of Russell Offices. Indeed, with the exception of a handful of advocates largely associated with the current Air Force leadership, there are very few who would support the decision. What has emerged over 12 months of public debate on this issue is that the case brought against the F-111 last year was centred entirely in non-sequitur arguments, mis-interpretations of technological and regional trends, and a good number of myths accepted as fact within the Defence bureaucracy. That a decision of such strategic importance to the nation was sold to Cabinet on the basis of so defective a rationale raises good questions about the intellectual rigour underpinning the whole plan for the future of the RAAF. The current budgetary allocation for the replacement of the F-111 and F/A-18A with new combat aircraft now sits roughly at A$12bn to $15bn, putting it in the category of more than ten Snowy Mountain hydroelectric schemes, five North West Shelf gas production schemes or ten Adelaide-Darwin railroad schemes. Decisions of such magnitude should not and cannot be made without a deep and comprehensive analytical process. Yet what we have observed with the F-111 and JSF decisions have been essentially arbitrary recommendations to Cabinet, justified a posteriori with an ever evolving gaggle of 'why we had to do this' public claims. The current plan for the RAAF's future is articulated in an Air Force submission to the JSCFADT entitled 'Air Combat Capability' and a subsequent ASPI Strategic Insight paper by the Chief of Air Force. This scheme envisages the effective close-down of F-111 upgrades after the current Block C-4 Mil-Std-1760/AGM-142 upgrade, and early retirement of the F-111 in 2010, contingent on the introduction of A330-200 tankers and new PGMs on the F/A-18A and AP-3C by that date. The JSF is currently the sole contender for the NACC program, with a decision to purchase being pushed for 2006, the year the first JSF 'production' prototypes are to fly. While the Defence leadership claim escape points in 2006 for the JSF decision, and 2010 for the F-111 decision, the reality is that the necessary provisions to effect such escape manoeuvres are not being performed, making both decisions effectively fait accompli outcomes. In the framework of the high risk JSF decision, the only viable long term alternatives to this aircraft are the more capable F/A-22A, and its yet to materialise larger offspring, the FB-22A 'regional bomber'. In practical terms, the choices for replacing the F/A-18A with a new type distill down to the JSF or the F/A-22A, while the F-111 could be further life extended, or replaced with more F/A-22As, JSFs or likely FB-22As, should they materialise. The case for purchasing the JSF over the F/A-22A as an F/A-18A replacement has been predicated on two basic assumptions. The first is that provision of supporting Intelligence Surveillance Reconnaissance (ISR) and networking capabilities will provide a persistent assymetric advantage over competing AWACS supported regional Su-27, Su-30 and subsequent Flanker derivatives, which now are likely to include AL-41F powered subtypes with supersonic cruise capability. The second assumption is that the JSF will provide an 'F/A-22A-like' capability at much lower cost, inside a viable timeline. Neither of these assumptions is now intellectually supportable, nor were they supportable when the JSF idea was hatched – they are little more than myths. The battlefield air interdiction and close air support optimised JSF cannot substitute for the air dominance and deep strike optimised F/A-22A in anything but a benign environment. In kinematic performance the JSF was optimised around the performance envelope of the F-16C and F/A-18, aircraft the Su-27/30 was built to kill. The F/A-22A has a sustained supersonic cruise capability, and is built to cover the kinematic performance envelope of an afterburning F-15 - or Su-27/30 - on dry engine thrust alone. In stealth capabilities, the JSF is shaped to perform best in the forward sector, and mostly in the centimetric radar bands, to defeat battlefield air defence threats and solo fighters. The F/A-22A was designed to defeat centrimetric and decimetric band radars, from all aspects, this encompassing fighters, long range SAMs and AEW&C radars. The F/A-22A's large APG-77 radar has around twice the effective coverage footprint of the strike optimised APG-81 in the JSF. In the strike domain, currently funded and planned avionics and weapons for production F/A-22As cover most of the capabilities in the JSF. While the F/A-22A is limited to the same basic internal GBU-39/B Small Diameter Bomb payload as the JSF, but with twice as many air-air missiles carried, it has much greater external payload capacity, and fuel capacity. Available budgetary data indicates that around 70 F/A-22A could be bought for the cost of 100 JSFs in the timescale of interest – Defence leadership claims otherwise amount to little more than further mythology. The prevalence of myths and non-sequitur reasoning observed in relation to the JSF vs F/A-22A issue, and the networking / ISR issues, are sadly also observed in the rationale for early F-111 retirement. The F-111 is presented as old, maintenance intensive, technologically obsolete, uncompetitive due to the absence of networking, and presenting unspecified risks of age related fleet loss.Yet there is no hard evidence to support these arguments, and what little has been presented conflicts with hard data. The F-111 remains a world class strike asset, with unmatched aerodynamic performance and a very modern core avionic system. It has range performance which permits significant economies in tanker numbers, and the large payload and persistence which is vital for battlefield interdiction in a networked environment. A good example of mythology lies in the three alleged 'surprises' resulting in F-111 fleet groundings, specifically leaking fuel tanks, wing fatigue related replacement and the fuel tank wiring induced explosion in A8-112. All were byproducts of long known about failures in maintenance and support planning and management, and all have since been corrected. With over 200 mothballed AMARC F-111s to raid for structural and system components, the option of structural and system component replacements with new, and an ageing aircraft engineering program in place, the F-111 could be maintained well beyond 2020, no differently than the B-52H and B-1B, both scheduled for 2035+ retirement. No less dubious is the myth that networking equipment would be expensive to introduce in the F-111 – the whole fleet could be fitted with JTIDS/MIDS terminals for an outlay of the order of A$20M to 30M. Mythology about the F-111 has not been confined to supportability and networking alone – virtually all public statements have avoided discussing the Mil-Std-1760 weapons capability paid for and now being fitted in the F-111C Block 4 upgrade. With Block C-4, virtually all of the weapons planned for the JSF and F/A-22A could be integrated on the F-111 for the cost of software and clearances alone. The case for the JSF over the F/A-22A, and the case for early F-111 retirement are not intellectually supportable by the evidence. 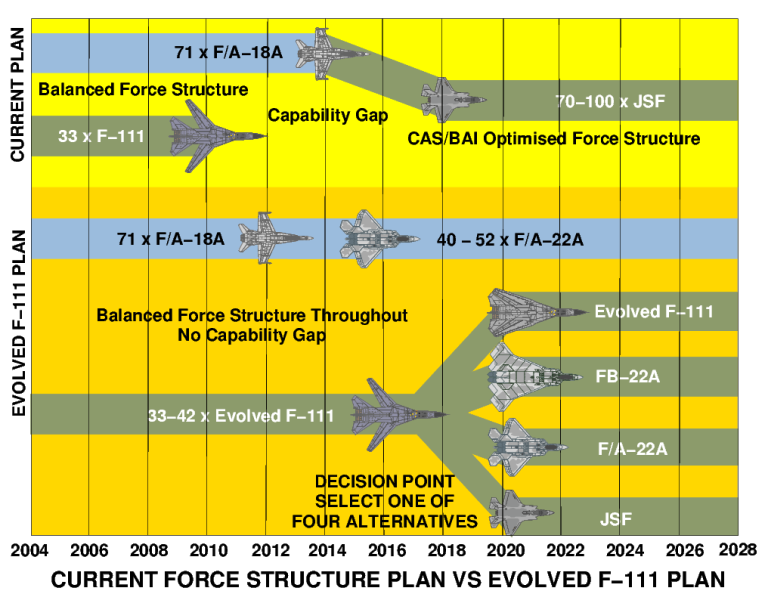 If the current JSF-centric plan for the RAAF is pursued further, and the F-111 drawdown and 2010 retirement are implemented, the RAAF becomes exposed to some significant strategic risks, and also loses what choices it still has today in long term force structure options. The greatest risk lies in the JSF itself, both in terms of its ability to address future capability needs, and in its delivery timelines and costs. The issue of JSF capabilities, costs and delivery timelines remains to a large extent in a state of flux, as the aircraft has yet to transition past the 'risk hump' in development. Until a definitive production configuration of each of the JSF variants enters Low Rate Initial Production (LRIP) later this decade, the aircraft's exact performance parameters and costs will remain uncertain. What is clear is that in 2012 we can at best expect to see expensive early build LRIP airframes, likely requiring extensive block upgrades later in the decade to bring them up to the then current production configuration. Weight issues remain hotly debated in the US, especially for the STOVL variant, which recently reverted to the smaller bomb bay configuration originally planned for STOVL/CTOL vs the larger bomb bay originally planned only for the CV variant. The US Air Force recently stated its intention to restructure its JSF buy of CTOL aircraft to a mix including 'hundreds' of STOVL airframes, possibly with further unique design features, to better support Army divisions with expeditionary CAS/BAI capability. This decision will impact the cost and timelines in the JSF program, as the USAF STOVL buy reduces the total number of CTOL JSFs built, and pushes a larger fraction of the total build into the timeframe of the STOVL JSF variant build. 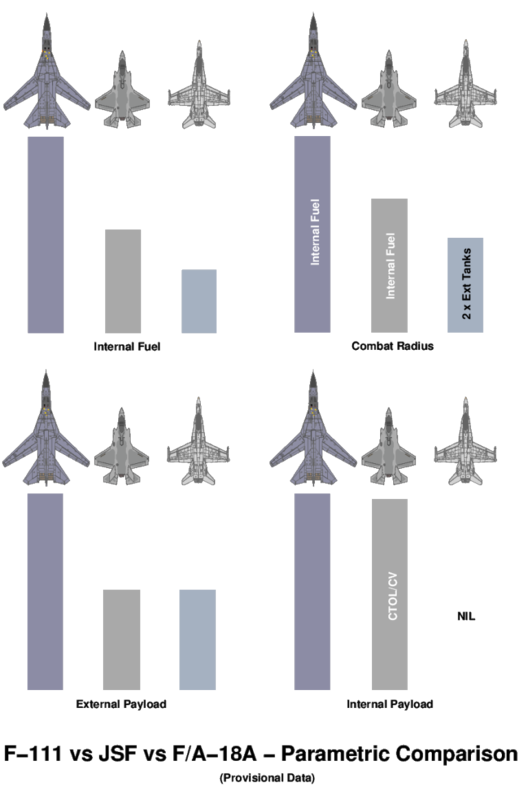 Given a fixed US Air Force JSF production budget, with average projected STOVL JSF flyaway cost around 30% higher than CTOL flyaway cost, the total number of JSFs built would be reduced further increasing unit flyaway cost across all subtypes. The combined effect of total JSF build number reduction will thus increase JSF flyaway costs, and drive up the cost of CTOL JSFs built early in the production cycle – exactly when the RAAF intends to buy them. In the simplest of terms, the LRIP CTOL JSFs which might be available to meet the RAAF's intended 2012 introduction will be become more expensive than expected six months ago, further narrowing the cost gap between the F/A-22A and the JSF. The publicly stated 'hedging strategy' for the RAAF is to provision for centre barrel replacements of around 60% of the F/A-18A fleet, to extend their structural life. Hornet centre-barrel replacement is a time consuming and expensive task, as the aircraft must be structurally pulled apart, the centre-barrel replaced and the whole aircraft then reassembled in a jig. The whole effort can see an F/A-18A in the depot for up to 12 months, subject to the resourcing of the rebuild, a very different proposition from the mere days of downtime required to swap a wing-set on the F-111. What comes out of the F/A-18A rebuild is the same aircraft with around one sixth of its structure zero timed, but with existing capability limitations. Given the prospect of late running and more expensive JSFs post 2012, the latter itself possibly impacting delivery schedules, the RAAF faces the real likelihood of rebarrelling a large fraction of the F/A-18A fleet during this period, at a cost of hundreds of millions. We thus observe a 50% order of magnitude capability loss with F-111 retirement in 2010, followed by a period in which a good fraction of the remaining F/A-18As are unavailable due to rebuilds. If we measure basic force structure strength in terms of total uplift of a common weapon type to distance, we observe the RAAF falling well below 40% of its current combat fleet strength. While the A330-200 tankers provide some offset in aggregate range/persistence lost, this falls well below what is being thrown away with the F-111. The alternative to this quagmire was presented to Defence some years ago by Australian Industry in the 'Evolved F-111' unsolicited proposals, a model in which the F-111 was upgraded and its service life extended past 2020 to permit acquisition of 40 to 50 late build F/A-22As post 2012, as F/A-18A replacements, thus pushing F-111 replacement into the post 2020 timeframe. This model is designed to manage and mitigate risks, spread budgetary outlays, avoid a capability gap. 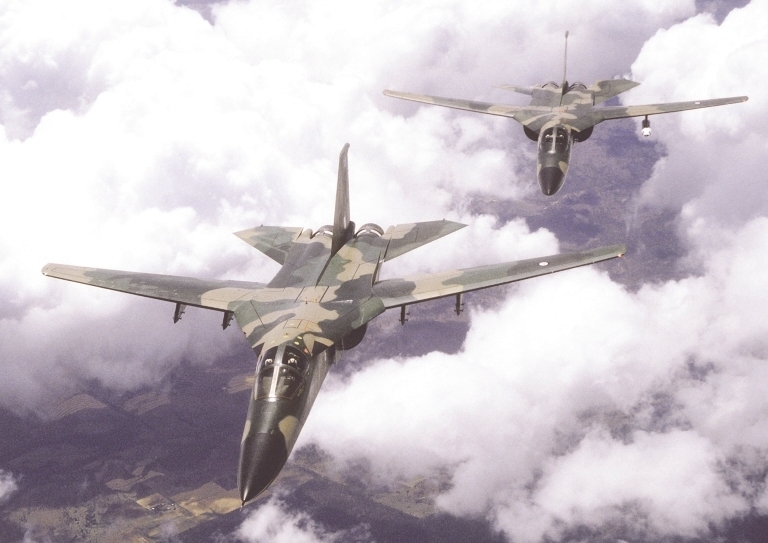 Its opens up four alternative strategies for replacing the capability in the F-111. These were further F-111 life extension, following the B-1B/B-52H model, replacement with FB-22As, or replacement with either more F/A-22As or JSFs, and additional tankers. A provision in this model was to swap 77 SQN from the F/A-18A to the F-111F or upgraded F-111G, to spread the fatigue load accrual in the F/A-18A fleet and extend fatigue life by around 30%. Early retirement of the F-111 destroys all of these alternatives, chops RAAF capability, and drives Australia down the path of permanent capability reduction in F/A-18A and later JSF-centric combat fleet models. What we observe today in force structure planning for the RAAF combat fleet, and its supporting rationale, is a fundamental realignment to a force structure which priorities battlefield air interdiction and close air support capabilities over the long established doctrine of prioritising air superiority and strategic strike capabilities. This unstated doctrine will expose Australia to pressure by regional nations, and increase dependency on US combat assets in an unprecedented fashion. The reasoning which justifies this change is underpinned largely by mythology, as proper analysis was never performed. Politically and strategically less painful alternatives exploiting the F-111 and F/A-22A all vanish as the current JSF-centric plan is implemented. The future of the RAAF – and the nation's long term strategic position in the region – will be decided over the next eighteen months.